Le Club Accorhotels has launched double & triple points bonus for stays in Switzerland between April 6 and December 31, 2015, that are booked in April. Registration is required. You earn double points for your first stay and triple points for the following three stays. You don’t earn bonus points from this offer after four stays. Note that it is unclear from the terms and conditions if it is required to book the 1 franc offer that comes with breakfast and late check out benefits. You can access this rate offer here. As is often the case with Le Club Accorhotels promotions, the terms and conditions are not very clear. If you are have stays coming up in Switzerland that you can book in April, why wouldn’t you collect the extra points? 1. 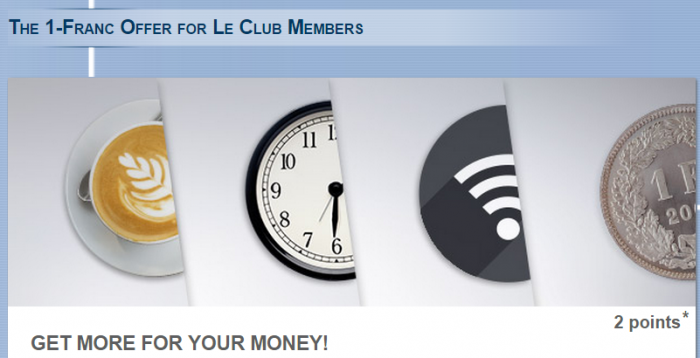 General Le Club Accorhotels terms and conditions apply to the “1 Franc for 2x / 3x Points” offer. 3. This offer is valid for a stay between 06/04/2015 and 31/12/2015 in one of the participating hotels in Switzerland and booked between 01/04/2015 and 30/04/2015. 4. This offer entitles Le Club Accorhotels Loyalty members, regardless of their status, to benefit from earning bonus points in one of the participating hotels Switzerland in addition to the existing 1- CHF Offer (for more detailed information please refer http://www.accorhotels.com/gb/hotels-offers/promotion-39794-promotion.shtml). The “1 Franc for 2x / 3x Points” is referring to the following scheme: 1. Stay – Double Points, 2./3./4. Stay – Triple Points.